I will be showing vintage Native American jewelry and jewelry from Taxco, Mexico as well as a limited number of pots and baskets. If you are interested in seeing something in particular from my website, please let me know and I will bring it to the show. Schillay Fine Art is also showing in the booth and will be featuring fine art spanning from Impressionism to Abstract Expressionism. Complimentary tickets are available. Please print the complimentary ticket below and bring it with you. If you have difficulty printing it, please let me know. This show is owned by Winterthur Museum. The dealers represent the finest Americana dealers in the country. Be sure to mark these dates on your calendar…it is a show not to be missed! Philadelphia Antiques and Art Show coming soon! The Philadelphia Antiques & Art Show will be opening on April 21, 2017, with a Preview Party on April 20th. It will continue through Sunday, April 23, 2017. The show is being held at The Navy Yard on South Broad Street and Intrepid Avenue. If you haven't attended this show recently, we want to stress that the show is being held in a structural tent (much like a brick and mortar building) on the grounds of the Navy Yard. Most of the dealers from the show have returned and all are bringing outstanding material to the show. We will be featuring a beautiful Zuni dough bowl, two outstanding concho belts, two fresh-to-the market pairs of moccasins, a very fresh Maidu basketry tray and more. We will be publishing photos of many of these items and more on our website over the next two weeks. It was wonderful seeing so many of you at the recent Whitehawk Show in Santa Fe and of course, we thank all of you who purchased from us. We also met new collectors and look forward to seeing all of you again soon. Marcy Burns had the first booth to the left of the show's entrance. The New York City dealer exhibits at the Philadelphia and Delaware Antiques Shows. For Whitehawk, she pulled out all the stops, showing more than two dozen pots against walls hung with Navajo weavings, beaded and painted hide artifacts and woven trays and baskets. A case loaded with Native American and Mexican silver jewelry produced some of her best sales. "I brought two major collections of pottery, one historic, one by modern masters. Both were very well received," said Burns. "Attendance was excellent, both in quality and number, especially on the opening two days of the show. By Sunday and Monday, be-backers overlapped with a fresh group of collectors just arriving in town. I am excited to have recently acquired two major collections of Pueblo and Hopi pottery: One collection features postwar works by the Matriarchs and other 20th century Master Potters. The other collection features very important Historic Pueblo and Hopi pottery, including 2 pots collected by Stevenson for the Smithsonian. I have also acquired a collection of parfleche bags. These objects are all fresh to the market. I will be posting frequent blogs featuring some of the individual items but be sure to go to the website frequently to see other additions as they are posted. If you follow my Facebook page, you will see notices for some of the new items posted to the website. Just click the little "f" in a blue circle and it will take you to the Facebook page. A second newsletter will follow shortly with more detailed information on the Delaware Show as well as information about some of the Historic pottery that I recently acquired. From October 23-29, my husband, Richard Schillay, and I will be hosting a booth at the INTERNATIONAL SHOW (formerly known as THE INTERNATIONAL FINE ART AND ANTIQUE DEALERS SHOW). We will be presenting a one-person show of ceramic art by Cliff Lee. The show is held at The Park Avenue Armory, 67th and Park Avenue, NYC. The booth number is D7. If you would like a complimentary pass, please send me an email and I will send you e-ticket(s) to the show. THE DELAWARE ANTIQUES SHOW COMING SOON! Remember, there are no sales taxes in Delaware! Good news from the recent Santa Fe shows for collectors and dealers: the shows were strong, sales were brisk, and dealers were buying new inventory. In addition, I have acquired a private collection of post-war Pueblo pottery that I will be adding to my website. This collection features works by Pueblo matriarchs and artists who are considered modern masters. I will do my best to frequently add fresh items. Please also do not hesitate to ask about a particular interest of yours...there are many objects that are not posted online. This blog includes a review of several new postings to my website, 2 upcoming Museum Exhibits that I recommend, and a brief memoriam to collector Fred Boschan. The Palm Beach Jewelry, Art and Antique Show will be held February 14-17, 2015 at the Palm Beach County Convention Center. I will be in Booth 207, sharing space with Schillay Fine Arts. Please click HERE for a complimentary one day ticket for two. If your collecting interests are in other categories like pottery, baskets, textiles and beadwork and you would like to see inventory that is not currently listed on our website, please contact us. We will send you photos and information. If you wish and if we can do so, we will try to bring the object(s) with us. We spoke to our dealer friends at the Winter Antiques Show. They all report strong interest and excellent sales. Looks like the market continues to make a healthy recovery! I am sad to report that this year's Philadelphia Antique Show has been cancelled due to administrative issues. Planning for next year's show has begun and we all look forward to an exciting and beautiful show in 2016. Marcy Burns American Indian Arts has an extensive inventory that includes exciting material that we have recently acquired. We hope that you will come visit our gallery (as I am a private dealer, we are open by appointment only). Also, of course, watch our website for new postings and contact us to find out what other material we might have in your interest area. Come visit us during Antiques Week in New York City! Coming to New York City for the numerous shows and auctions during Antiques Week in New York City (January 20-25, 2015)? We hope that you will take the time to visit us as well! Marcy Burns American Indian Arts is a private gallery is that is set up to exhibit to you. We hope that you will call or email and set up an appointment to visit. We are delighted to be participating in the 12th Annual Palm Beach Jewelry, Art & Antique Show, February 14-17, 2015. We will be featuring vintage Native American and Taxco jewelry and can be found in Schillay Fine Art, Booth 207. Please feel free to contact us if you would like to learn more about what we will be bringing. It is very interesting to compare this wonderful pot to one that is in the collection of The School of American Research. Dwight Lanmon believes that these two pots were made by the same potter and we have to agree. The potter has made two pots of very similar shape and design elements but she has made differing use of color and space in filling in the basic elements. To read more extensively about these pots, go to our discussion on our pottery page. The Antique Dealers of America (ADA), is excited to announce our 2ND ONLINE SHOW, which opens on Tuesday, December 2nd and runs through Thursday, December 4th. This is a unique show in which the top Americana dealers in the country offer items for sale, much as in a formal antique show, accompanied by a full warranty. I have posted 15 items in the show, with descriptions and prices. Most of these items are not listed on my website. I have posted additional items to my website and you should feel free to check those listings as well. The easiest way to my offerings in the ADA ONLINE SHOW is to search the site for "MARCY BURNS" or "MARCY BURNS AMERICAN INDIAN ARTS LLC". Alternatively, items I have posted will also be found under "NATIVE AMERICAN" and "DECORATIVE ARTS". All items are priced and can be purchased directly on the ADA website. I will be available during the show to answer any questions or concerns that you might have. FREE SHIPPING WITHIN THE CONTINENTAL US DURING THE MONTH OF DECEMBER! TAKE ADVANTAGE OF THIS OPPORTUNITY TO SAVE!! We are happy to offer you free shipping within the Continental US throughout the month of December! We were so delighted to see so many of you who came to the Delaware Show to see our booth. Thank you so much! The Delaware Antiques Show will open soon, with the Opening Night Preview on Thursday, November 6, and the show continuing on Friday, November 7th-Sunday November 9th. The National Museum of the American Indian is celebrating its founding in 1989 and its New York City location at the Customs House with a 20th Anniversary Gala and new exhibit. In addition to posting our monthly newsletter releases, we plan on entering information about recent acquisitions, exhibits, museum exhibits etc. Please "Like" us on our Facebook page. This will help other people discover Marcy Burns American Indian Arts. The Delaware Show is fast approaching. This year is the 51st year of the show (! ), clearly making it one of the oldest American antiques show in the country, and it is thriving! The show opens on November 6th for a charity preview and continues with regular admission November 7-9, 2014. The show is owned and sponsored by Winterthur Museum, which has one of the great collections of American decorative arts. Plan on combining a visit to the Museum with a visit to the show! Navajo concho belt, mid-20th century or possibly earlier. The Navajo (Dine') learned how to work silver in the mid-nineteenth century. They had long appreciated silver jewelry that they acquired from Southwestern Hispanics and Plains tribes but it is generally believed that they did not learn how to make metal jewelry until circa 1850 when Atsidi Sani became friends with a Mexican smith named Nakai Tsosi. Tsosi taught him how to work iron so that he could make bridles that he could sell to other Navajo. After the end of the Navajos' internment at Bosque Redondo near Fort Sumner in 1868, Nakai Tsosi taught Atsidi Sani how to smith silver for jewelry. He, in turn, taught his sons and other Navajos. Another silversmith, Atsidi Chon, went to Zuni in 1872, where he taught Lanyade how to work silver. Other men in turn taught silversmithing in the 1870s to men in Acoma, Laguna, and Isleta. One of the earliest forms of silver jewelry that the Navajo made were "conchos", also called "conchas", worn on leather belts. The form derives from Ute conchos that were worn as hair ornaments or long drops hanging from belts. By the late 19th century, the Navajo began to set stone in the conches. These belts went on to become iconic and they continue to be made today. The earliest concho belts were made out of hammered coin silver. Their designs progress through stages, beginning with an oval shape that was scalloped on the edges, elementary stamping and chiseling. The center of the First Phase concho was an open diamond or oval and the back had a copper loop through which a leather belt could pass. As time went on, the designs became more elaborate. Note the Navajo concho belt that is pictured to the left: The center of the concho is now pushed out through repousse' work and the center of the concho is closed. In addition, a fine turquoise square stone has been added to the center. The concho is backed in some instances such as this with a leather backing. The railroads arrived in the Southwest in the 1880s. The Fred Harvey Company opened shops in the railroad stations and provided a ready market for Navajo silver. As a result, silver smithing flourished and designs were elaborated, often reflecting Anglo taste. The concho belt to the left has arrows that are intricately worked into the design, an example of some of the high-quality Fred Harvey jewelry that was offered. Concho belts continue to be worn and valued by the Navajo and Anglos alike. Quality work continues into contemporary times with a continuation and development of traditional designs. The belt to the left has beautiful repousse', wirework, and quality turquoise stones. It is hard to definitively date it. 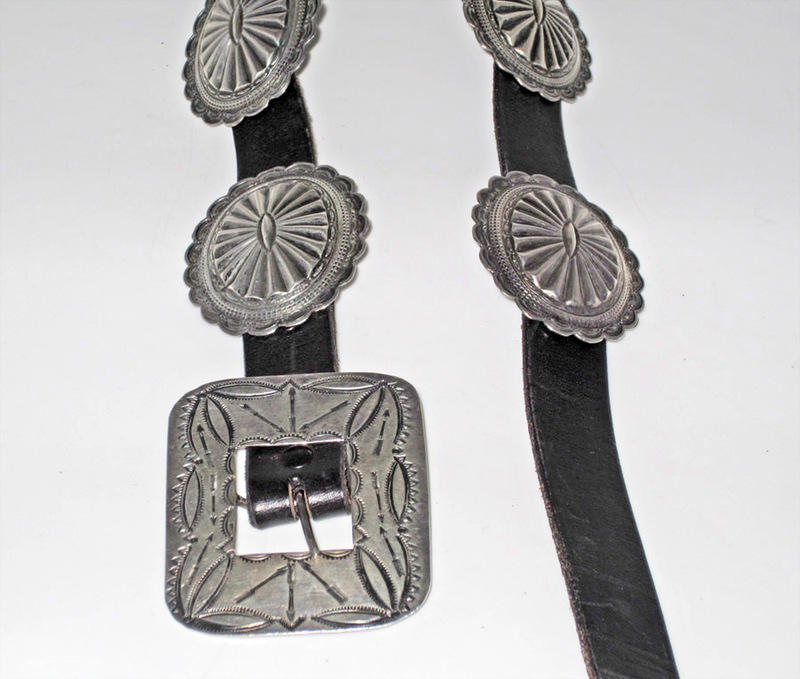 During the Depression through World War II and into the 1950s, the Navajo made concho belts that were not on leather, perhaps because of a shortage of leather. They are made out of sterling silver. They were made for sale. Most women had small waists at that time; thus many people wear this style as a necklace today. The Philadelphia Antiques Show is coming soon and it promises to be one of the best shows of the year! In addition to expanding to include 20th century art, the show now has a professional Director, Catherine Sweeney Singer, who is also the Director of the Winter Antiques Show in New York.